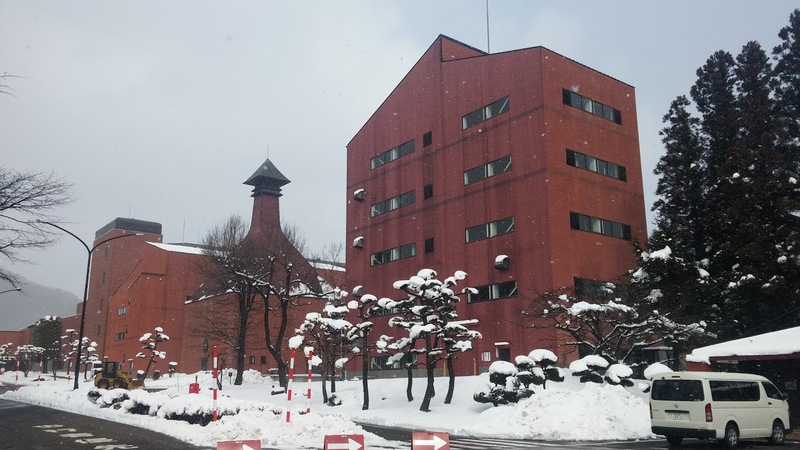 Today we're travelling east from Sendai to tour the Nikka Whiskey Distillery before pushing further into the snowy North; up to Hakodate in Hokkaido. 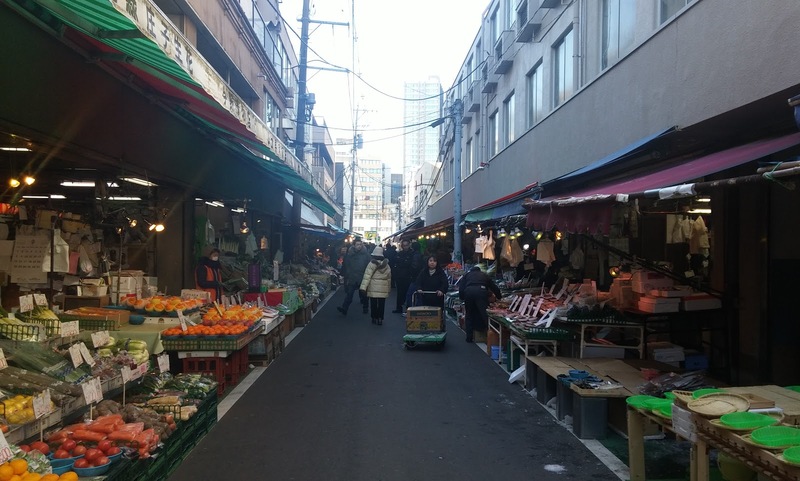 After waking in the morning, we left our luggage at the hotel, then went to visit the Sendai morning markets, where Kate purchased a couple of giant apples and some dango to have later for lunch. 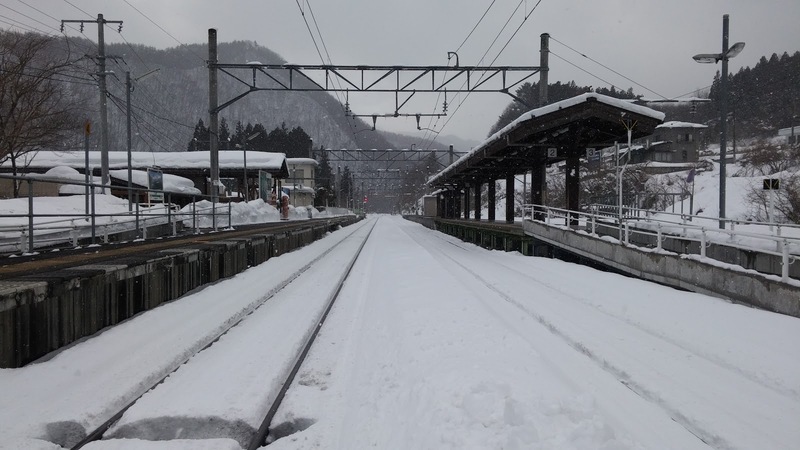 After the markets, we caught a train and arrived at Sakunami Station about forty minutes later at around 11am. 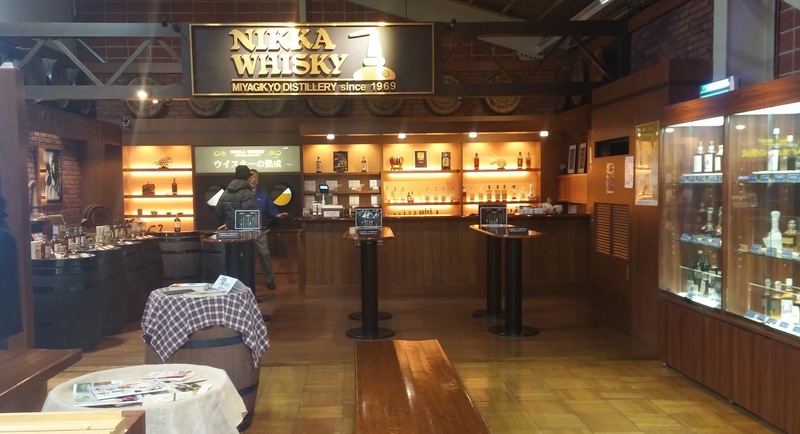 Unfortunately, the distillery is about another half an hour walk from the station, and although there is a shuttle bus it only runs seasonally. Getting off the train we realised that the chances of a bus pick up were slim to none as it was snowing quite a bit, and we were one of only a few people to get off at this station. To our dismay after about a 15 minute walk we realised we were going in the wrong direction and ended up having to double back, resulting in about an hour's walk in the freezing snow. Anyway we eventually reached the distillery and made our way to the visitor centre, arriving around 11:30. Our bad luck continued when we found that there were no tours between 11:30 and 12:30, but we didn't really mind too much as there was a nice waiting room in the visitor centre where we could sit and warm up. Despite the cold weather a decent number of people showed up and joined our tour, though no one else was silly enough to walk from the station as they all had cars. The first part of the tour consisted of a brief explanation of the different buildings in the factory, all in Japanese. I had read that the tour would include visit to the kiln tower where it was possible to hold and smell the peat they use to give whiskey its smoky flavour, though for whatever reason that was not included as part of our tour. 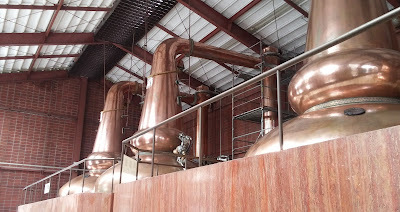 We did however get to go into distillation room to see the distinctive distillation towers, which were gurt with sacred rope used to enshrine deities. 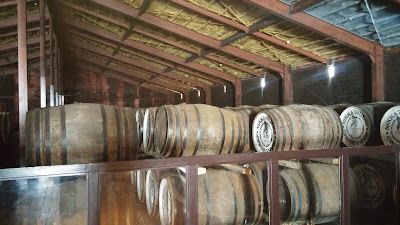 Next we went to have a look at the storage warehouse which is a dark building full of barrels of whiskey which are slowly being aged. 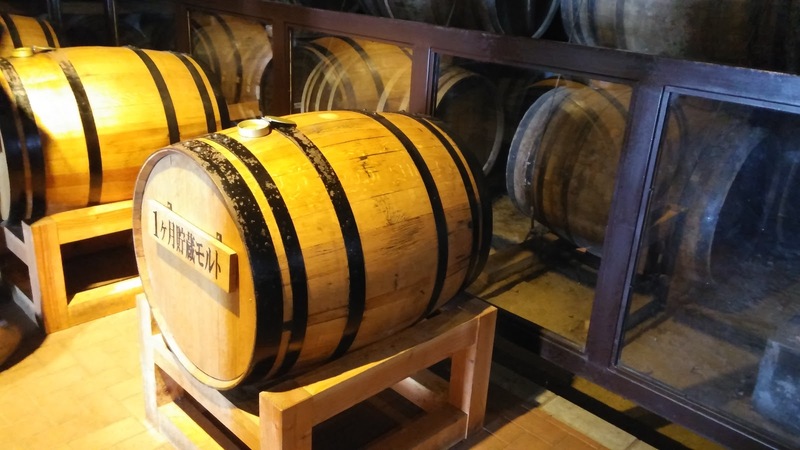 A few barrels containing whiskey of different ages were set-up so we could view and smell the difference that aging makes. Another noteworthy barrel was from 1969, which was the year the distillery opened. 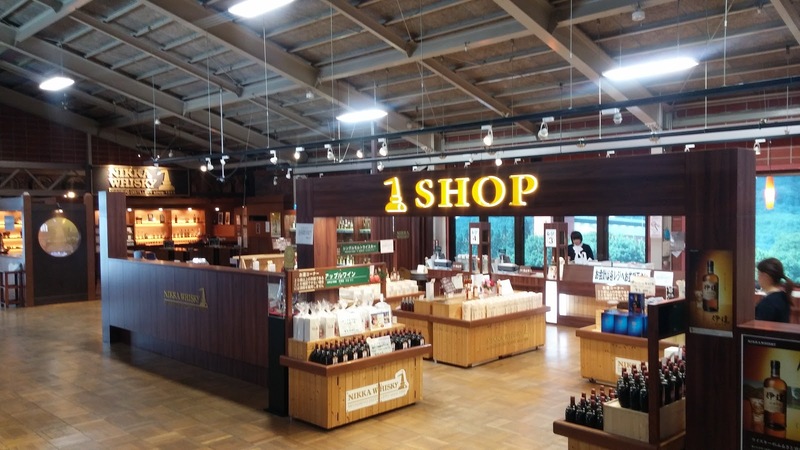 Finally we returned to the visitor centre where it was tasting time! The tasting was also free, although there was an extra section where you could pay to try extra special bottles. After watching a brief video on how to best enjoy whiskey we were able to enjoy a number of different bottles which were pre poured into glasses for us. 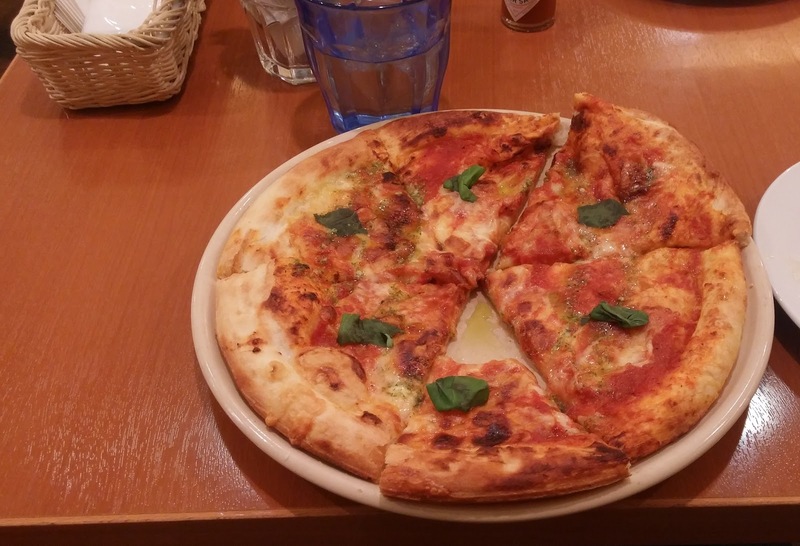 I actually didn't appreciate the tasking as much as I would have liked as I wasn't into whiskey at the time, though I am now, so I would like to go back again. 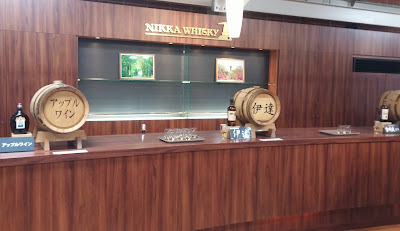 Some of the brands we tried included Nikka Date (伊達) blend and some single malt Miyagikyo (宮城峡). Apart from whiskey they also had some apple wine which we liked so we bought a bottle of that, and some small 50ml bottles of whiskey as well. After our tour we rushed down to the main road outside the factory and caught a public bus back to Sakunami station. Upon arriving we found the small shop in the station to be shut, although there was a little waiting room we sat in while we waited for the next train. We got back into Sendai station at around half past three and I had a margarita pizza as a late lunch and early dinner from one of the restaurants inside the station building. 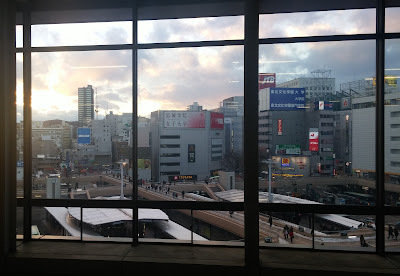 After that we caught the next shinkansen to Aomori, where we changed to another train which completed our journey to Hakodate, arriving at around 9pm. 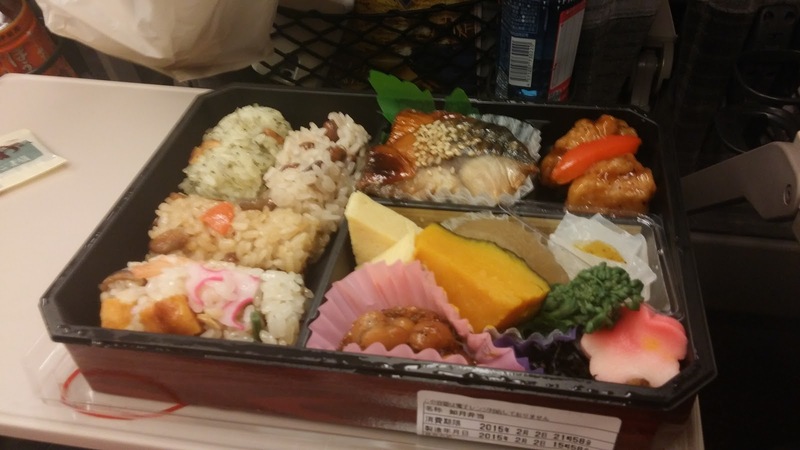 While on the train Kate enjoyed an eki-ben, or train lunch box, for dinner while I had a couple of doughnuts for dessert. 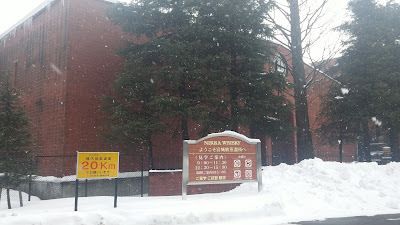 Our hotel in Hakodate was the Comfort Inn, which is somewhere we've stayed before. Tomorrow we'll be visiting the morning markets and Round One Sports Entertainment in Hakodate before continuing in onto Furano.